Last Monday I posted a detailed look at the new semi-protected bike lane on Chestnut Street, today a follow up to a January 2009 post on the narrowest bike lane. 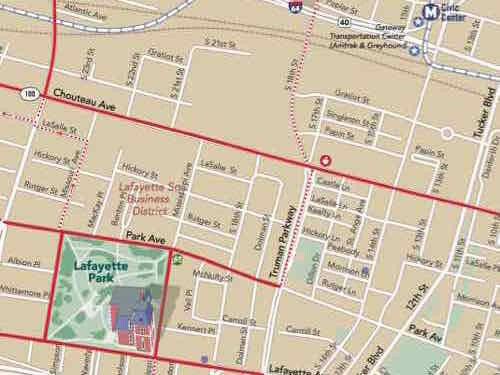 As was the case six+ years ago, the latest Bike St. Louis map (web | Scribd) shows bike lanes on both sides of Chouteau. Some say it had bike lanes at one time, but MoDOT restriped Chouteau and did away with them. What I saw in January 2009 was two solid white lines in the Westbound direction — they remained when I visited again on July 23rd. These lanes aren’t about bikes, they’re a way to narrow the outside drive lane from excess pavement. 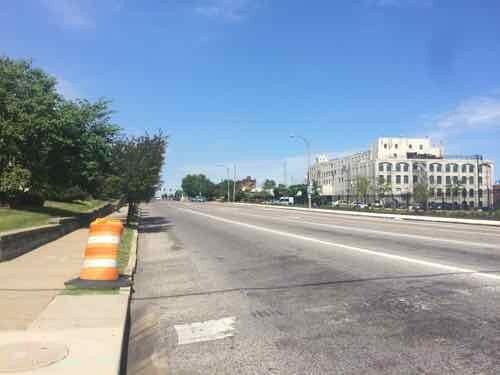 On the South side of Chouteau, also looking West from Tucker, we see a wide outside lane — no bike lane. The map’s legend shows a solid red line as dedicated bike lanes in both directions, dotted red as shared lanes.. This section of the map shows Chouteau in solid red. Todd Antoine, from Great Rivers Greenway, told me MoDOT is starting now to resurface Chouteau, when finished it’ll be striped with dedicated bike lanes. The map available in January 2009 also showed dedicated bike lanes, I don’t know what maps in between indicated. Given the road width I expect to see a reduction in the number of travel lanes from four to two, which shouldn’t be a problem given our light traffic. Still, it’ll likely upset those who want lots of wide lanes for cars. I’d be surprised to see them reduce the lanes. MoDot seems keen to continue 4 lanes when possible. Just spent the weekend in PDX and marveled at how most major roads are now just 1 lane each way with a center turn lane – and bike lanes both sides. Bike lanes with very, very heavy use. 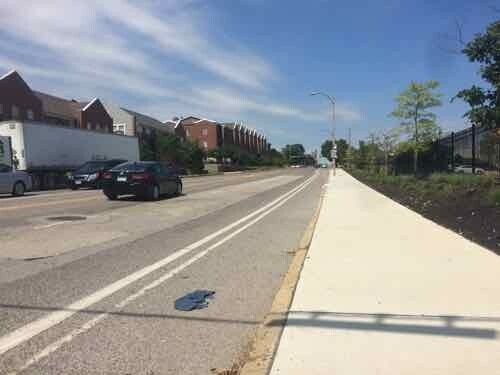 It’s not about “wanting lots of wide lanes for cars”, it’s about dedicating appropriate resources for actual uses and actual users. We could also stripe more jogging paths and more bridle paths, at the “expense” of vehicle lanes, IF there were enough (any?) demand for those uses. We live in a community. It’s about sharing. It’s about using limited resources wisely. It’s about balance. I don’t have strong feelings, one way or another, about bike lanes along Chouteau. I do have strong feelings about the mantra that motor vehicles are always evil, since the vast majority of us CHOOSE them as our preferred method of getting around. I wonder if our government should consider banning ownership of all motor vehicles and bicycles because using them on the open roadways can be potentially harmful to the user? No offense, Steve, but I think your war on cars is going a little too far. Whether we like it or not, automobiles will remain the main form of transportation for the foreseeable future. I’d love to take transit to my job, but it would turn a 20 minute drive into 2 hour trip with multiple connections. I’m all in favor of road diets where they are appropriate – South Grand is a perfect example. But, St. Louis has many arterial streets which need to be able to handle volume and reasonable speeds. I get very frustrated over the calls in various South City neighborhood Facebook groups calling for adding cul-de-sacs or speed bumps to slow down traffic. We have a street grid and it needs to be preserved. That’s why I love the City and have no desire to live in a sub-division in Chesterfield. As for Chouteau, there’s plenty of room to build bicycle lanes and maintain two lanes of traffic. The pictures you took show that. My bigger concern is return on investment… simply building bike lanes will not get a significant portion of our population to travel by bike. Your post on the Chestnut bike lanes is a perfect example — a grand total of 2 bicyclists in an hour. Huh, war on cars? Not sure what you’re talking about. Being pro-bike/pedestrian/transit doesn’t make me anti-car. Cities need to accommodate all modes. Being pro-bike/pedestrian/transit may not make you anti-car, but focusing exclusively on bikes, peds and transit, especially when the solutions invariably involve taking away existing “car” infrastructure, sure makes you sound anti-car. Your closing statement (“Still, it’ll likely upset those who want lots of wide lanes for cars.”) was a gratutitous swipe at motorists, and unnecessary for the rest of the balanced narrative that preceeded it. I wasn’t going to comment, originally, since “I don’t have strong feelings, one way or another, about bike lanes along Chouteau.” But, much like Greg stated, the continuous digs at motorists dicredits your otherwise well-reasoned arguments. If “cities need to accommodate all modes”, then all modes must be respected. For nearly 11 years I’ve written about my experiences in the city/region — as a motorist, cyclist, scooterist, transit user, pedestrian on foot & wheelchair. For years I’ve written about the car shows — including Chicago’s big show in 2014 & 2015. For decades public policy has favored cars — and yes I highlight that. I’m also a motorist, but I’m a pedestrian more often. Contrary to the usual comments of JZ that everything has to wait on demand (his inference is that there is no point in trying to improve St Louis since there isn’t “demand”), we find that is not the case. The article correctly points out that public policy and subsequent infrastructure can make bicycle use more attractive and desirable. No, my inference was not “that there is no point in trying to improve St Louis since there isn’t ‘demand'”, my fairly clear statement was that “it’s about dedicating appropriate resources for actual uses and actual users”. St. Louis voters are being asked to approve a significant bond issue on Tuesday, to pay for a wide range of unmet “needs”. 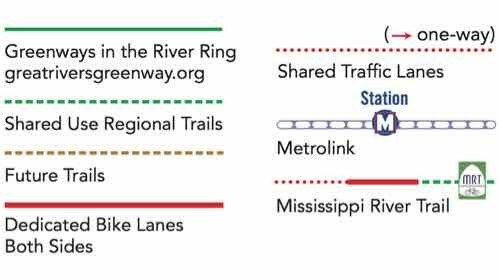 Bike infrastructure does not come “free”, it takes spending some of the city’s (and the state’s) finite, limited resources. Bike lanes, like highways, libraries, fire trucks, curb ramps and social services need to be prioritized. I have no idea if there is a need (or not) for more and better bike lanes on Chouteau. If there is, spending the capital, in both actual dollars and political blowback, would be worth it. But if it’s being done absent any actual ridership studies, solely on the hopes of “build it and they will come”, then yes, I will continue to have my doubts and questions. And as for Davis, the weather and demographics, compared to here, are significantly different. They’re doing some great things, and so are quite a few other big college towns. Before moving here, I spent many years riding hundreds of miles of bike paths, bike lanes and bike friendly (and unfriendly) streets around the Boulder-Denver-Aurora metro area. I have a pretty good idea about what constitutes a wise expenditure, as well as seeing a few truly white elephants / stupid expenditures. Paint is cheap, and if it helps novice riders, I’m usually good with it. But spending money, just for the sake of spending money, without “connecting the dots”, having a plan for filling in the missing links and creating a viable network, does more than just frustrate cyclists, it gives anti-cyclists ammunition to question spending money on future projects. I’ll repeat, “I don’t have strong feelings, one way or another, about bike lanes along Chouteau.” Asking if there’s a reason to spend public dollars is not anti-anything, it’s called being prudent. You may believe that the city and the region have unlimited resources; I know better!